“Of the centenary tributes accorded Leonard Bernstein this year, few could be more personal than this one … which struck the right balance between biographical portraiture, charming nostalgia, and loving remembrance” (The Washington Post). Hailed by WTTW‘s Chicago Tonight as “sensational,” this glittering, intimate journey into the life of the charismatic conductor and composer was a smash at its Lincoln Center premiere and has played to solo-out theaters in dozens of cities across America. Hosted by his daughter Jamie Bernstein and featuring acclaimed soprano Amy Burton and pianists John Musto and Michael Boriskin, this multi-media cabaret is an affectionate portrait of Bernstein, sampling his most intimate works, as well as his favorite music, including works by Aaron Copland, Zez Confrey, Noel Coward, Raymond Scott, Franz Schubert, and Edvard Grieg. Also includes personal stories, and rare, archival audio and film clips of the Maestro himself. With a special post-performance dessert reception, and book signing by Jamie Bernstein of her best-selling new memoir, Famous Father Girl: Growing Up Bernstein. 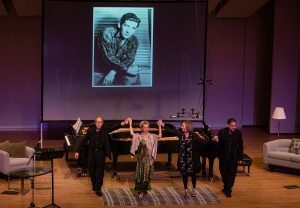 Part of BernsteinBash, our season-opening festival celebrating the Leonard Bernstein Centennial.